The irony of the gun control debate is that when it seems tighter gun control policy is coming, sales spike. "[W]e experienced strong consumer demand for our firearm products following a new administration taking office in Washington, D.C. in 2009," said the management of gunmaker Smith & Wesson. That's when President Barack Obama moved into the White House. The explanation for this phenomenon is pretty simple: If there's a risk that you won't be able to buy guns in the near future, then buy your guns now. Sadly, the biggest pushes for more gun control come after high-profile shootings, like the 2012 killing of 20 children at Connecticut's Sandy Hook Elementary School. And it's following those incidents that gunmakers report strong sales. In its presentations to investors, Smith & Wesson management celebrate the seemingly ever growing demand for firearms. One proxy for demand is the volume of background checks that get submitted to the FBI's National Instant Criminal Background Check System, or NICS. 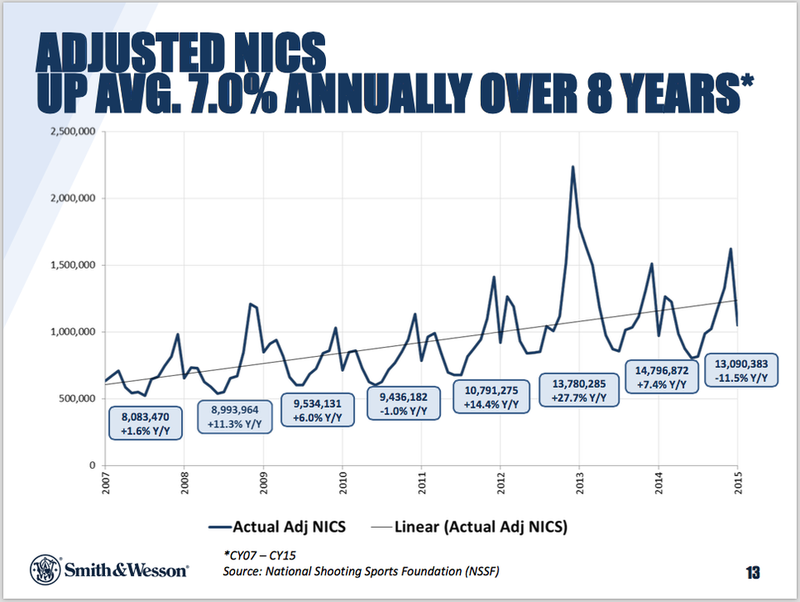 As you can see in the chart above, NICS is going up. On Thursday, Smith & Wesson announced better-than-expected quarterly earnings, driven by a 6.2% increase in sales. "We are very pleased with our fiscal 2015 results, particularly our fourth quarter performance," CEO James Debney said. "Looking forward, we anticipate further sales and earnings growth in fiscal 2016 as we continue to position our company for long-term success." To be clear, gunmakers don't benefit from tighter gun control. They benefit when there are talks of tighter gun control but those talks go nowhere. Should tighter gun control actually get signed into law, then you would have a different story. Smith & Wesson explains: "Currently, federal and several states’ legislatures are considering additional legislation relating to the regulation of firearms. These proposed bills are extremely varied, but many seek either to restrict the makeup of a firearm, including restrictions on magazine capacity, or ban the sale and, in some cases, the ownership of various types of firearms. "In addition, if such restrictions are enacted and they are incongruent, we could find it difficult, expensive, or even impossible to comply with them, impeding new product development and distribution of existing products."